Home Local News BREAKING! SEN. KIKO PANGILINAN IS MORE WORRIED IF NAPOLES SPEAK UP ABOUT PORK BARREL SCAM! BREAKING! 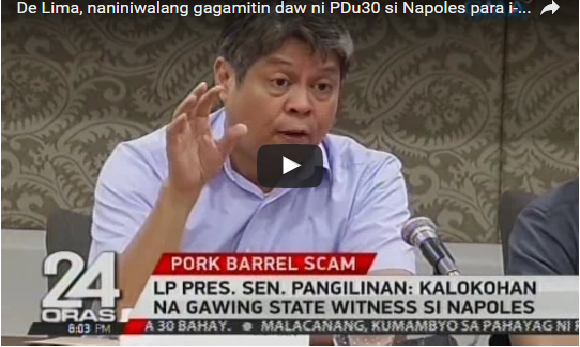 SEN. KIKO PANGILINAN IS MORE WORRIED IF NAPOLES SPEAK UP ABOUT PORK BARREL SCAM! Liberal Party President Sen. Francis "Kiko" Pangilinan said the acquittal of Janet Lim Napoles in her illegal detention case is a "bad sign" for other pork barrel cases linked to her. Citing reasonable doubt, the Court of Appeals (CA) acquitted Napoles for the crime of serious illegal detention in connection with the alleged abduction and detention of her former aide and relative, Benhur Luy, and reversed a lower court ruling that found Napoles guilty. But Presidential Spokesperson Ernesto Abella said in a press briefing that there was no discussion on Napoles turning state witness. He added that President Rodrigo Duterte did not mention it either.